As you probably know we’ve got a cat and not a small wimpy one at that, but a large in your face orange tabby. Unfortunately, sometimes his cat box is large and in your face even though you’re using odor control cat litter. That’s why we were thrilled to find Fresh Step Cat Litter with Odorshield at Sam’s Club and in such a large 42 pound bag! Seven is no longer a spring chicken at 13 years old and he’s also borderline diabetic due to his magnificence. Borderline diabetic means from time to time that he uses his cat box a lot. Like really a lot and everyone knows it. Being a food blogger it’s important to me that his cat box be as smell free as possible since its right around the corner from the kitchen. 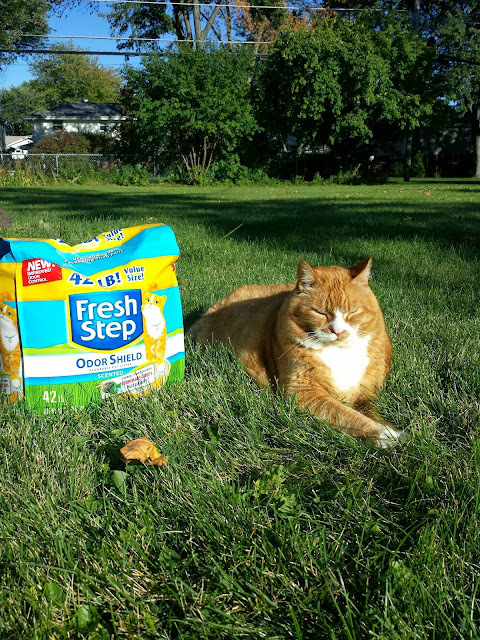 That’s where Fresh Step Cat Litter with Odorshield comes in, it uses chlorophyll to naturally deodorize the litter box. Let me tell you now, that it truly works wonders! There are no longer odors you don’t want in your kitchen at my house. When I used to live in Seattle, Seven would camp out in the other cat’s box until he needed to use the facilities just to make them mad. That’s the kind of persnickety cat I have. He’s incredibly stubborn and when he doesn’t want to do something, he doesn’t do it. Which brings us to cat bearding, have you seen it? 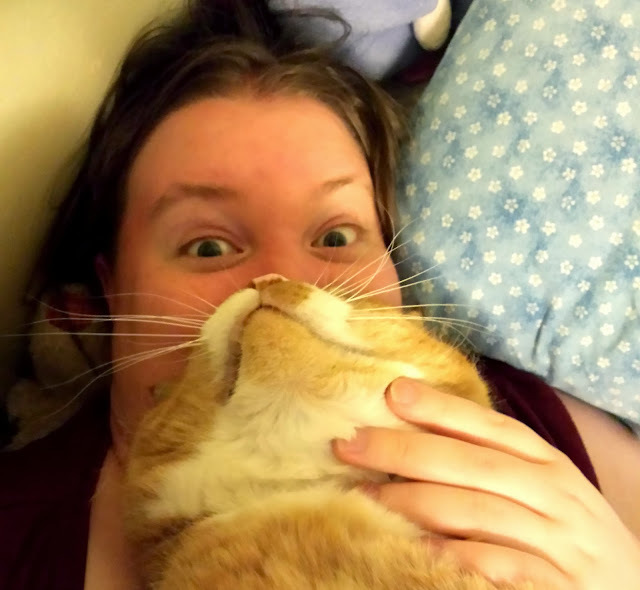 Its basically where you tip your cat’s head back so their nose, mouth and chin look like they are yours instead. Seven does not like cat bearding at all. He doesn’t like to tip his head back or move when he doesn’t want too. He does not want to expose his vulnerable neck not even for his favorite humans. Trust me, 30 pounds of orange tabby is hard to work with especially one that has all of his claws. We decided to try a cat Afro instead. 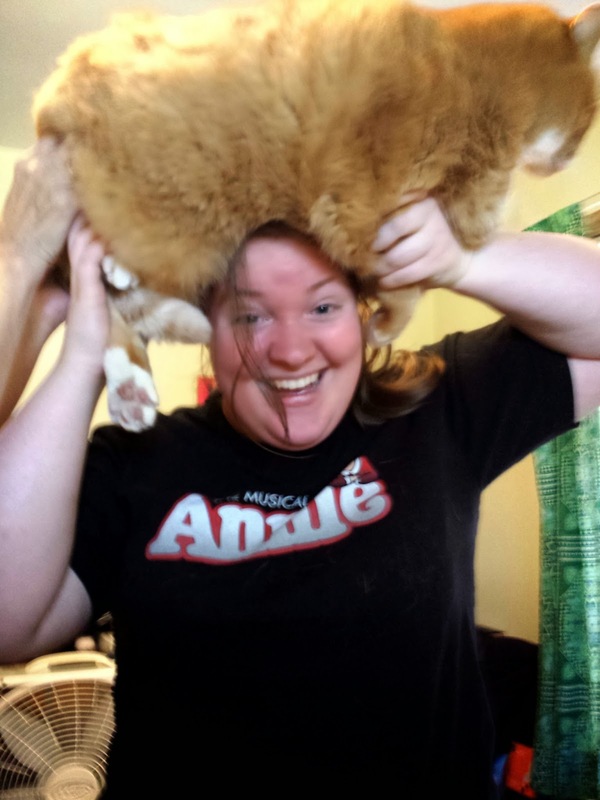 While this was easier to get Seven to agree to, he’s a little hefty to hold over your head for any amount of time. As well as his dislike of being raised high into the air. This cat is one that doesn’t like to expose himself for fear of being weak. So, the fresh step litter is a way for our kitty to hide his scent, meaning he has one less thing to worry about. Now, he can avoid smell detection and spend all his time demanding the treats he deserves while honing his seasonal disguises. 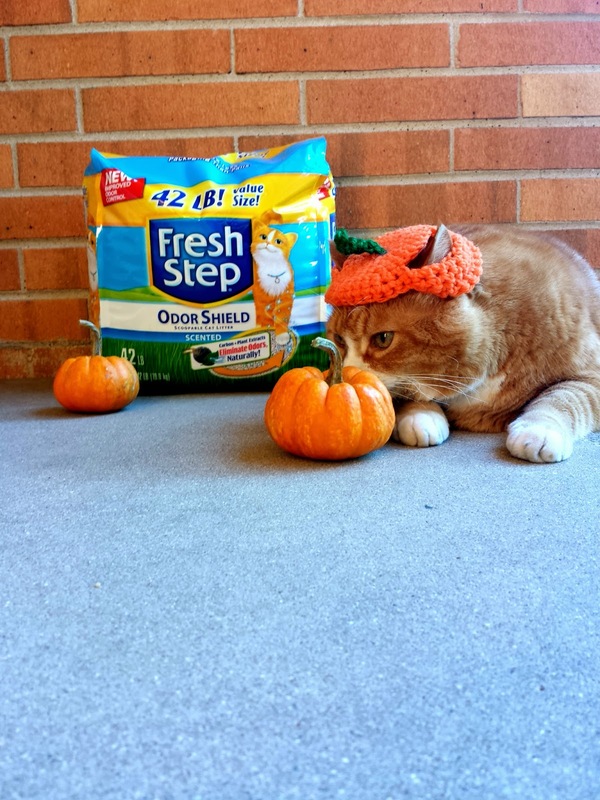 Now through October 31st, when you buy the big 42 lb bag of Fresh Step Cat Litter with Odorshield at Sam’s Club you can earn double paw points!! But only if you purchase Fresh Step at Sam’s. Have you tried your hand at cat bearding? If you have, Sept. 30th is the last day to submit your cat bearding photos to win a $1000 prize! You can read all about it on Brie Brie Blooms. He is a pretty big guy, but incredibly active. The vet always told us orange male tabbys just have that swinging belly body shape. Awww poor kitty in the pumpkin hat- I can't talk really, we put antlers on ours for Christmas cards last year. Looks like he's a good sport though- love the cat afro, and the new kitty litter. I haven't smelled my litter box in weeks, since switching! 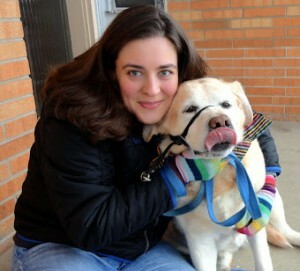 Jenna- He's pretty darn easy going after being raised by 4 kids, one of them a boy that dragged him everywhere. He'll even give up his prey if you catch him with it.